If you like, Cabaret and Chicago then go and see The Players Theatre Company and their production of Curtains. Written by the same writers, Kander and Ebb it has fabulous music, clever lyrics and great choreography. 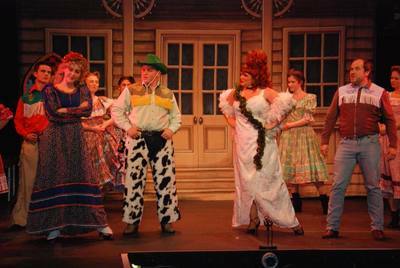 Not only is it a musical, but a musical within a musical, in the style of Oklahoma and Seven Brides as well as a Who Dunn It, so there is something for everyone. Curtains takes place in a Boston theatre where just after curtain call the leading lady is bumped off. Lt. Frank Cioffi arrives to investigate the case, but is a theatre addict, and an amateur actor, when not investigating crimes. He becomes more involved with making the show a success, and falling for the young ingénue than solving the crimes, as one by one more people are killed off. Unfortunately, life imitated art and the lyricist Fred Ebb died before the show was finished. However, another well- known lyricist, Rupert Holmes, finished the songs. Although the show was a success on Broadway starring David Hyde Pierce of Frasier fame, it was never performed in the UK until recently. As the star struck detective assigned to the backstage murder investigation, Ian Scoging has not only to solve the murder of the unpopular leading lady (Zena Sandgrove-Graham) but rescues the cheesy western musical Robbin Hood from failure. He nicely underplays the part and turns into The Singing Detective. The show opens with a musical scene from the western and immediately draws the audience in with its energy and zest. Zena plays the over the top lead in a big and brash style deliberately singing out of tune and dancing out of time. As she has a good voice, it was obviously hard to be so bad but she did it brilliantly. It was a shame that she was killed off, as I was hoping that she would do an Agatha Christie and turn up alive. Another brash star of the show was Jenny Hitchcock. She dominated the stage and belted out her numbers like a latter day Ethel Merman, with a good voice, and ‘put downs’ like Mae West. The ensemble were having great fun with high quality singing and dancing the slightly risqué numbers that brought the house down. They even involved the Musical Director Sue Edwards, joining in from the Orchestra Pit. I particularly liked the songs What Kind of Man about who would be heartless enough to be a critic, and another comic ensemble piece, The Woman’s Dead about their despised leading lady. The ever-reliable Jonny Buxton and David Breen gave good support. Jonny as the composer Aaron Fox sung a particularly poignant song I Miss the Music about his ex-wife who was his lyricist, sung in the old style of a Hollywood musical. Phoebe Allan as the young ingénue Niki, and Ellie Cornford as Bambi both brought a young, vibrant energy to their parts with Ellie doing cartwheels and acrobatics. 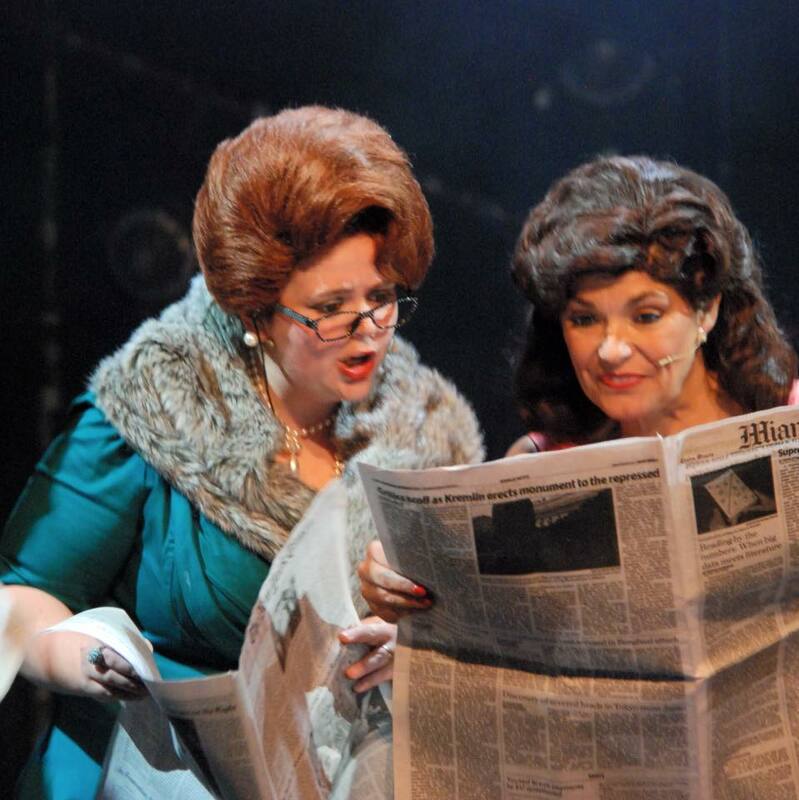 Claire Poth as the lyricist who takes over the leading lady role has a very strong voice and sings beautifully. Additionally, her husband, Nick Poth playing the slightly camp director sashayed around the stage throwing out barbed comments with real style. The musical has references to famous people and other musicals and, in a way, is a pastiche of many kinds of theatre, but all done with tongue in cheek. I take my hat off to the director Julie Robertson for tackling a large cast musical on the small Palace Stage with its severe rake. The Players have a reputation for tackling new or lesser-known shows; it is great to see something different and done so well. Prices shown are inclusive of any applicable booking fees. Groups of 10+ please call 01702 351135 to buy fee-free. I really enjoyed it, as it was very entertaining. I hadn’t heard of the musical before, I came because I had friends in the show. I thought the quality of singing and the scenery was very good. I thought it was slow at the start but it was more entertaining in the second half. There was quality singing and great costumes.